I Just read about ‘PYNOT’ which uses video for job seekers so they can “stand out”. Its yet another video resume app. PYNOT stands for (Put Your Name Out There), out of Utah, the startup has an iphone app and website. Job seekers can browse the website or app for relevant job positions and apply with a 60-second video, produced on their own phones. I hate to break it to them but competing with the ‘big job boards’ is a pipe dream. 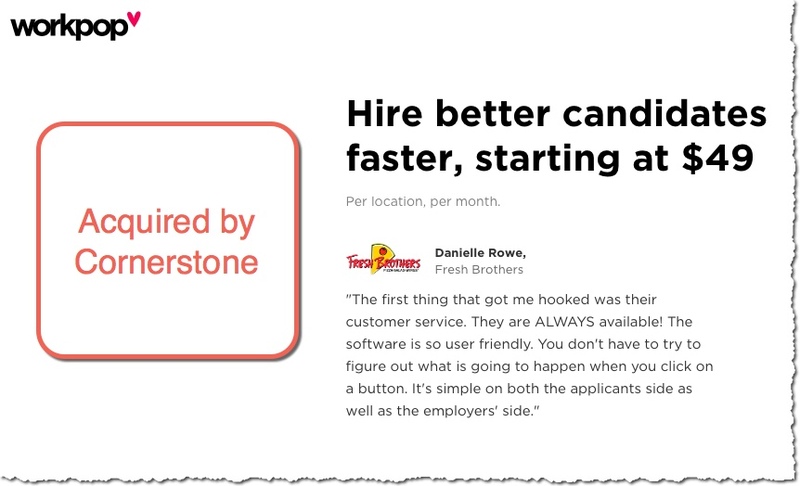 A feature does not make you better than ZipRecruiter, Indeed, even Monster. I applaud him for building something but wish he had talked to me first. An app is a limited channel. Any kind of service like this needs a web version as well. There is a role for video in recruiting. But it generally works best as a built in feature of an applicant tracking system. Also it should just be an option for the job seeker. Most people are unwilling to video themselves. Given the choice, recruiters would rather spend 5 minutes reviewing 10 resumes vs 5 minutes viewing 3 videos. Traditional resumes are more efficient. Just because video is cool doesn’t mean its a good use case for job search. Health eCareers is expanding its brand through a new partnership with KevinMD.com. Founded in 2004 by practicing, board-certified internal medicine physician Kevin Pho, MD, this high-traffic website reaches thousands of providers daily and receives more than 3 million monthly page views. As social media’s leading physician voice, KevinMD.com has more than 250,000 followers on Facebook, Twitter, and LinkedIn and reaches about 141,000 providers via email. It’s the first big move the job board has made since being acquired by Everyday Health. Partnerships like this will provide a solid boost to its own job listings. As part of the partnership, all of Health eCareers’ provider jobs will appear on the Careers by KevinMD.com career center and feature opportunities for physicians, nurse practitioners, physician assistants, and nurse anesthetists. The career center will be incorporated into KevinMD.com and will also include valuable articles, enriched employer profiles, and access to CV consultations to support providers looking to advance in their career. Both Health eCareers and KevinMD.com believe that the partnership will bring significant benefit to health care professionals and employers alike. While at the HR Tech show last week I came across a bit of surprising news. A big applicant tracking vendor bought a job board company. Cornerstone acquired Santa Monica based Workpop for an undisclosed amount and plans to roll it up into a new product line called ‘Cornerstone Frontline’. To be fair, Workpop is more than just a job board. It’s a job distribution tool built specifically for the service industry but they also own RestaurantJobs.com. They say they deliver a better candidate experience for users by offering a “place to grow and learn“. We offer tools that help candidates find better jobs. Our platform is designed to give back to candidates, whether it’s peer resume feedback or application analytics. Workpop communicates your likelihood of hearing back from an employer before applying to the job, and ensures that you get an answer on every application. They launched in 2014 and in 2015 Cornerstone actually invested in them through their innovation fund. I must admit that I knew very little about Workpop and was surprised to hear this news. It is rare for an ATS vendor to buy a jobs service, especially one that only caters to one industry in the SoCal market. There are plenty of vendors that already help you distribute jobs online so why not partner with them? I guess the team at Workpop had something different to offer. Recruiting expert Gerry Crispin tells me that Workpop is doing great things. “I had no idea”, I told him as we walked through the expo hall. I had not even heard their name mentioned in the industry since those early days. Just goes to prove that if you build something different and focus on delivering, good things will happen. Last week it was announced that NBA star Shaquille O’Neal has invested in an Atlanta jobs app called ‘Steady’. The company just raised $9 million from investors including Shaq who will also be an ambassador to the company. It’s more like a way to make extra money rather than a traditional job site. They see it as an income building platform. Either way it is the latest entry into the gig/job app market. Full-time jobs are giving way to more flexible arrangements—shift work, part-time contracts, gigs, and an endless combination of these—that create income uncertainty; retirement resources aren’t cutting it for millions of Americans; and the resulting income mix throws people’s relationship to banks and financial products out of balance. Steady starts by helping BYO workers easily find and apply to income-building opportunities that match their availability, abilities, and interests. Whether augmenting retirement savings, working around childcare responsibilities, leveraging gig opportunities, or supplementing insufficient income from a primary employer, Steady helps people earn more. We are in the infancy stages of all these apps but I just like the fact I get to write about Shaq taking part in our industry. There is so much interest in using technology to help people find work or make more money it is attracting celebrities and helping create innovation in talent acquisition. It will be fun and interesting to watch this market grow. CareerChain has launched ‘Bizzy’ as the first open industry standard for sharing career histories that will put applicants a couple of clicks away from their perfect job. It could be an example of how blockchain fits into job search…that is if job boards and ATS vendors adopt it. Here’s how they describe it. Job seekers today are expected to enter so much repetitive information in job application forms that they give up on good opportunities quickly when it takes too much effort to apply – especially when they search on mobile. Job applicants generally must complete 10 to 20 online application forms before getting hired – having to re-enter work history, education, contact details and skills summaries over and over again. Job seekers soon get demotivated and start skipping over some great jobs that require too much effort to apply. Bizzy profiles are the easiest way to apply for jobs – enter once, apply everywhere! 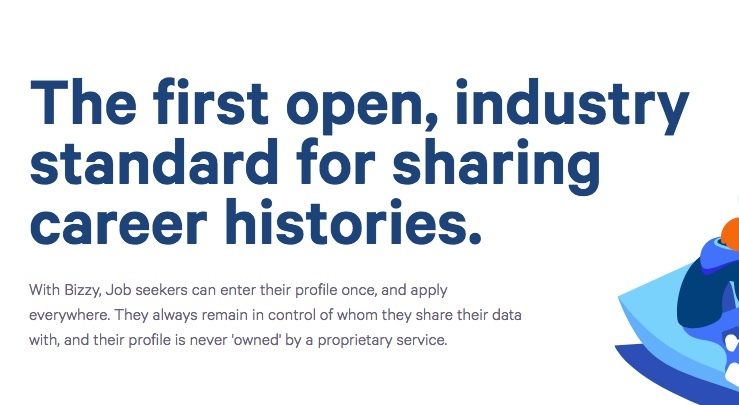 Built on the blockchain, Bizzy profiles can be trusted and shared with anyone from any device while also protecting privacy and data. Job applicants won’t need to think about blockchain, digital wallets, Ether or Bitcoin – they’ll just carry on using their favorite job sites, create a profile automatically and apply for jobs easily with the Bizzy button. Bizzy is the brainchild of co-founders Ray Gibson (20 years in recruiting and HR) and Andrew Evans (a co-founder at Careerbuilder.com). After 4 years leading their recruitment software company, StartMonday, to becoming a public listed company in the US, Canada and Germany, they spotted an opportunity to apply blockchain technology to solve a real problem and make a massive impact on the job market. The CareerChain team is currently traveling the world educating businesses and HR professionals about the impending shift in the job market. CareerChain is also raising money in the form of a private token sale that will be used to further develop and roll out the Bizzy platform. I had the chance to speak with Michael Hurwitz who runs CareersInGovernment.com – a site that was started back in 1996. I think you will find some interesting stuff in this 30 min interview particularly around the future of niche job sites. Last week LinkedIn introduced support for a ‘Remote” location when posting jobs. 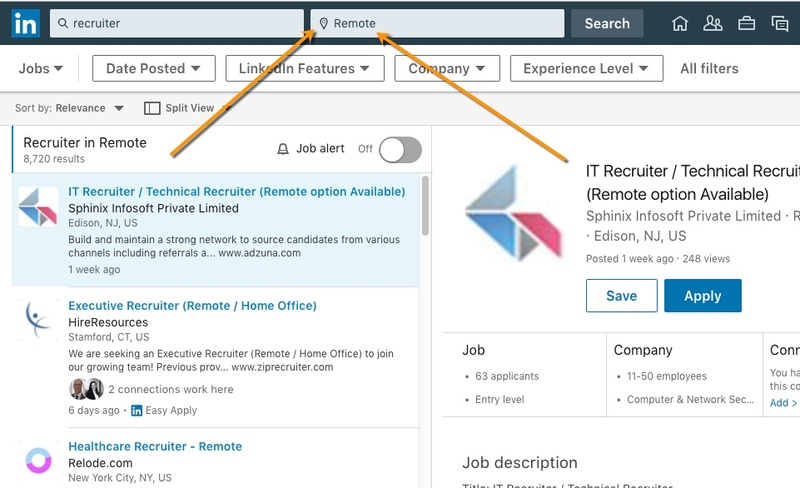 This now allows job posters to enter a location as remote by typing it in that field. Seems simple, but its the best way to address this long standing problem of remote job listings. Recruiters could also use some other types of location entries, namely: nationwide, regional and multiple location. A nationwide posting could simply be listed as ‘United States‘ and I have seen job boards support that entry before. “Regional” listings are a bit more tricky but could include entries like Northeast, Southwest or Mid-Atlantic. Multiple job locations are a favorite of recruiters but only some job boards allow posters to use multiple locations on a single posting. I realize you shouldn’t let them select too many locations so its probably best to limit it to 5-10 overall. Giving job posters more options like this are ways job boards can evolve. Listen to your clients and give them them new reasons to work with your site. Silent Professionals helps veterans who have combat-related military occupational specialties in multiple ways. The site translates vet resumes into a language that civilian employers can understand. Its job board includes openings across a wide range of security-oriented roles, as well as jobs in logistics, administration and other areas. Registration and access to the entire site are free for military and law enforcement veterans. Littleton, CO, August 04, 2018 — Avjobs, a global leader in connecting aviation jobs with aviation candidate’s, today announced the release of its newest high-performance web interface. The pioneer of aviation niche job boards launches technical advances that will connect more aviation candidates to more aviation jobs anywhere, and easier than ever before. 2018 marks a pivotal moment in Avjobs, Inc. history as they announce substantial improvements with the launch of its newest web interface and brand experience. Just like its successful launch 30 years ago and every improvement since, this is a significant event for the company, its aviation job board, visitors and clients as they place more job announcements in front of the right audience at the right time delivering more results than ever before. 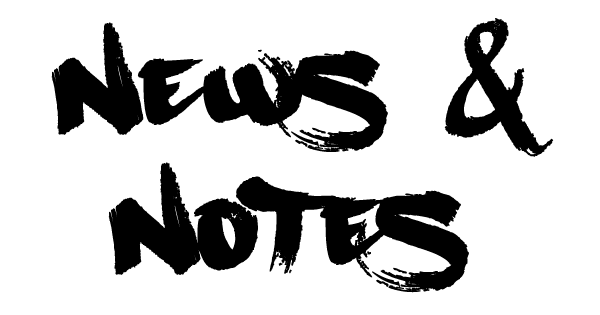 The release introduces significant updates all created with the user experience in mind. The modern interface caters to both the aviation job seeker and recruiter and delivers the robust and functional online experience users expect. Enhancements include easier targeted job search and application process, fresh content, improved flow, speed and navigation, comprehensive branding for Employers through job postings and Career Mini Sites, enhanced search engine optimization and more eyes on job postings. All enhanced features and functions keep users engaged throughout the process and deliver results. The redesigned site is also mobile friendly giving user’s full access on a mobile device or tablet anywhere, anytime. Ahead of the 2018 peak campus recruiting season, Uncubed is announcing new features, and an expanded network, designed to help companies reach top technology students across the US. “Most companies still rely on a core or target school structure, where they focus most of their resources on 20-30 schools. These tend to be predictable lists, made up of highly ranked and expensive colleges, or where executives graduated from. But this overlooks countless talented students who don’t attend these target schools for any one of a number of reasons, and it dramatically limits the diversity of your applicant pool,” said Brian Shoicket, Uncubed’s Chief Operating Officer and the head of the company’s university program. Uncubed’s all-digital offering allows companies to access the tech and digital talent in the Uncubed student talent network, without the cost and time investment of additional campus trips. The Uncubed platform uses engaging video and editorial content to engage students with job opportunities. New candidate relationship management (“CRM”) features deliver a multi-step experience as opposed to the purely transactional nature of the traditional job application process. Newly enhanced analytics deliver invaluable insights into candidate engagement. Further, Uncubed offers a curation service which combines Uncubed’s proprietary technology and the company’s expert service team to deliver the most qualified candidates. Uncubed’s candidate network now extends to more than 500 colleges, universities, and other educational platforms and attracts students with tech and digital skillsets, including software development, front-end and back-end engineering, data science, digital marketing, and more. Students are attracted to the Uncubed community due to the access they get to videos, webinars, and other online content that prepares them for technology careers. Uncubed also offers access to jobs at tech startups, corporate innovation labs, and other groups that don’t typically visit a large number of campuses. CareerChain launches Bizzy as the first open industry standard for sharing career histories that will put applicants a couple of clicks away from their perfect job. 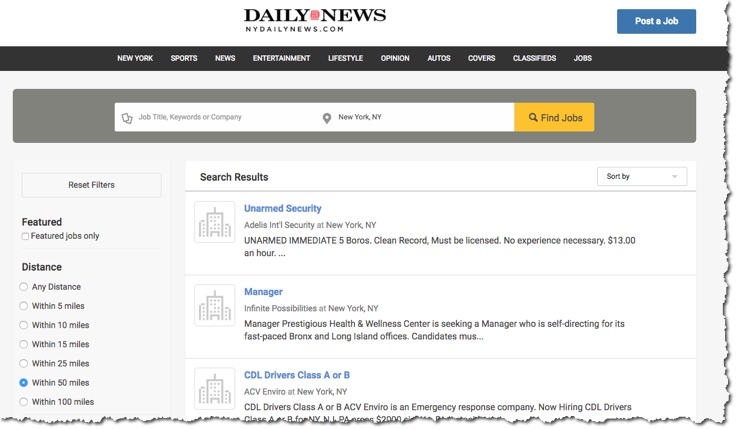 The owner of the Chicago Tribune, New York Daily News, and several other top news brands have partnered with Recruitology, providers of a talent recruitment platform to power more of their top media properties. It was announced via press release yesterday. Recruitology will power local job boards for the Tribune Publishing properties, as well as the Los Angeles Times, and the San Diego Union Tribune. Here’s a screenshot of what it looks like on the Daily News (NY) version. According to the release, media specialists at these properties will also offer employers vertical-specific job targeting to candidates on niche job boards in areas such as healthcare, education, technology and finance. At the same time, employers will be able to take advantage of programmatic advertising campaigns that distribute jobs to the local media site and to large national job sites while automatically setting and adjusting the bid price on the sites to which these jobs are sent. “As the trusted source of local news in each of its markets, Tribune continuously aims to innovate in order to bring the best solutions to its audience and advertisers.” said Gladys Arroyo, Vice President of Classifieds for Tribune Publishing. “We look forward to collaborating with Recruitology to offer employers a turnkey recruitment solution”. Angulo tells me they now power 65 boards and growing. Newspapers have long outsourced their job sites to companies like Monster and CareerBuilder. But those firms did a poor job of leveraging that traffic and helping their media partners make money. It’s good to see players like Recruitology take a fresher approach. God knows the newspapers need the revenue.